Adobe has accidentally let an early version of "Project Nimbus" —a primarily cloud-based photo editor —slip out to some Creative Cloud subscribers, according to a report. Nimbus users should have access to 1 terabyte of storage, versus the 20 gigabytes normally assigned to Creative Cloud customers, said French site MacGeneration, which obtained numerous screenshots of the Mac and Windows software before it was removed as an available download. Adobe has confirmed the leak's authenticity. The extra storage is presumably necessary because both images and non-destructive edits are saved online, making it possible to work from anywhere. The software is said to be similar in some respects to Lightroom for the iPad, and should offer some organization features —most notably automatic keyword tagging based on image analysis. 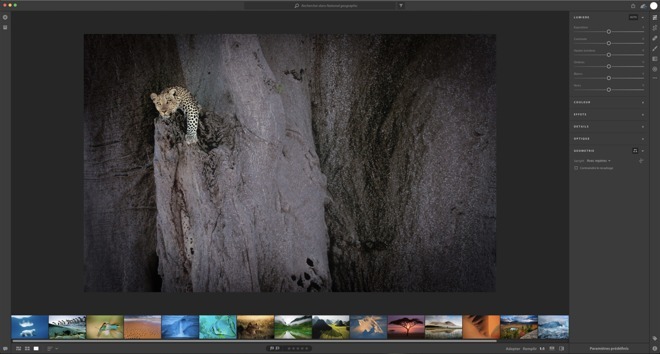 It's not expected to replace the desktop version of Lightroom however, as it offers a simple, centralized interface, dispensing with separate modules. Adobe first teased Nimbus as far back as Nov. 2016, and a beta is due by the end of the year. The concept is similar in some respects to Apple's Photos apps for macOS and iOS, which can sync edits between each other automatically via iCloud. An important difference is that Photos is free to Apple device owners, barring any iCloud storage upgrades. A Creative Cloud Photography subscription —under which Nimbus will presumably fall —costs at least $9.99 per month, but also includes professional, multi-platform software in the form of Lightroom and Photoshop.